It’s a simple fact that the industry as a whole lacks the framework to provide clear cost estimates to patients in an era of rising out-of-pocket costs for medical care. According to a recent Forbes article patient payments now account for thirty-five percent of provider revenue, whereas in 2000 that number was just five percent. 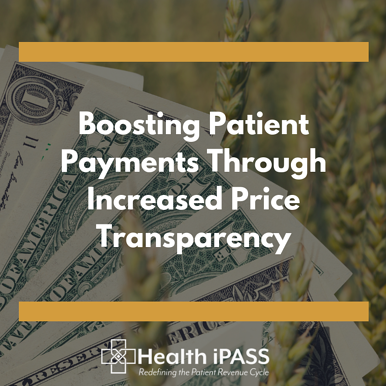 It is critical for providers to act now to determine and use the right tools to provide greater healthcare price transparency so that patients can budget and plan for medical expenses. Collecting patient payments has become quite a challenge due to an increasingly complex healthcare revenue cycle where providers must chase money from multiple payers. To make matters worse, patients often do not know the cost of care or what they may owe out-of-pocket until after a service is rendered, leaving them confused and frustrated.. In a May 2018 MedCity article “The Hidden Costs of Healthcare’s Hidden Costs,” Health iPASS CEO and founder Rajesh Voddiraju describes the payment process of the healthcare industry: “There’s the fact that we often don’t know what we’ll be charged until after we’ve had a procedure done. Imagine if your local coffee shop worked like that: ‘Based on how tired you seem, we think you’ll need a venti caramel macchiato.’ They hand it to you then send a bill 30 days later for eighteen bucks.” No one likes getting a surprise bill in the mail, so why does the healthcare industry continue to function this way? The primary reason patient payments have skyrocketed is the recent exponential rise in high-deductible health plans (HDHPs). These plans have lower premiums and higher deductibles, leaving patients more financially liable for the cost of care. A survey found that the average deductible for the most popular type of HDHP is $3,937. Additionally, the average deductible for people with employer coverage rose from $303 to $1,505 between 2006 and 2017. As a result, patients are much more attentive to the cost of the care and prefer to know expenses up front through cost estimates with flexible payment options, including structured payment plans for higher balances. Historically, patient billing has occurred after the claim adjudication process and may take up to 60 days to issue a statement. The problem is not always the patient’s unwillingness to pay— in fact, the research proves that patients want to meet their financial obligations. A survey conducted by Waystar, Inc. determined that thirty-five percent of patients said it was inconvenient to pay for healthcare services, a fifteen percent increase from 2017. This is cause for concern for health care providers because missed payments are money that they need to remain in business. By providing clear cost estimates before care is rendered and enabling convenient payment methods, providers will begin to see a decrease in aged accounts receivable and bad debt. The landscape of healthcare has changed. With the rise of HDHPs, patients are raising their hands to ask how much they are paying for the cost of care. With 35% of revenue coming directly from the pockets of patients, providers must implement modern patient revenue cycle solutions that increase price transparency, build patient loyalty/trust, and increase income. In Field of Dreams, Kinsella’s leap of faith paid off-- Shoeless Joe Jackson and many other famous baseball players did come to play at Kinsella’s baseball field. Channel your inner Ray Kinsella and listen to that voice forecasting the future of patient payment collection. Invest in a patient revenue cycle solution that provides cost estimates up front along with convenient and easy payment options.